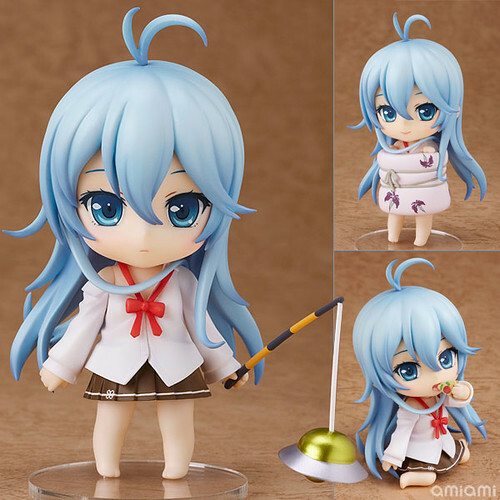 As promised, Nendoroid Touwa Erio from light novel/anime series Denpa Onna to Seishun Otoko is available for pre-order starting today. Yep, you can secure your reservation for the adorable self-proclaimed alien at your favorite figure stores now. Cousin, I’m going to be a Nendoroid! From ‘Denpa Onna to Seishun Otoko’ comes a Nendoroid of the self-proclaimed alien, Erio Touwa! She comes complete with parts that allow her to to be displayed wrapped up in a futon, as well as parts that let her stick just her head out of the futon! She also comes with extra bits that let you pose her sitting on the floor, munching on her favorite food – pizza! She even comes with the UFO attached to a stick – plenty of optional parts allowing you to display her however you prefer! In fact, there are so many parts that you can display a second Erio using nothing but the optional parts! She is scheduled for late January 2012 release with a price tag of 4000 Yen. This entry was posted in News and tagged denpa onna to seishun otoko, nendoroid, touwa erio. This nendoroid is why they make nendoroids! So kawaii! And of course, I’m gonna pre-order her.